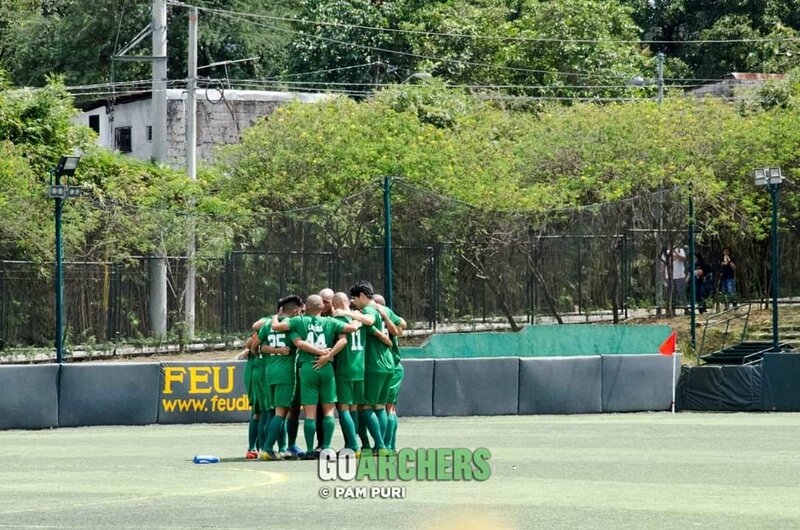 The De La Salle University Men’s Football Team picked up yet another unfortunate result on Thursday afternoon at the FEU Diliman Football Field as they fell on the wrong side of a 3-1 scoreline against rivals Ateneo de Manila who in turn reclaimed their spot on the top of the table. The score fails to reflect the complexion of the match for both teams had a fair share of chances to score. If anything, the experience the Season 79 champions have proved to be the difference as several of them put on stellar displays to deal the young La Salle side their second straight loss. La Salle actually took the lead in the 10th minute when Mauro Acot maximized the time and space inside Ateneo’s half. The midfielder whipped up a ferocious strike to send the ball flying over Ateneo goalkeeper AJ Arcilla and into the top corner. An array of half chances followed suit for La Salle but no one else converted those glorious opportunities. The men in green would end up counting the costs of not cushioning the lead as the Ateneans struck back as soon as six minutes after they went behind. Julian Roxas teed up Jarvey Gayoso inside the box and the striker did well to steer the ball beyond Gab Villacin’s reach as it sneaked into the goal. The equalizer set up an exciting first half with both teams not holding back in pursuit of a breakthrough. Eventually, the third goal of the match belonged to the Eagles after a gutsy move by Mark Nacional led to a tidy finish by Rupert Baña two minutes before the break. DLSU kept looking for a way to go back on level terms with rookie Shanden Vergara testing the Ateneo defense twice early in the second half. Arcilla proved to be a proverbial brick wall as his presence between the sticks continued to frustrate the Lasallians. The challenge of overcoming the deficit became more difficult midway through the second half as Alfonso Montelibano, the hero of last round’s encounter, turned zero this time around. Coming off the bench, the forward was sent off for two bookable offenses in quick succession. Nevertheless, La Salle continued to threaten the Ateneo defense. Vergara, Mikio Umilin, and Xavier Zubiri kept the opposing defenders on their toes but with not much experience among them, they couldn’t make a slowly deteriorating Eagles’ defense pay. Instead, the desperation for the equalizer led to a well-executed counter attack late in the game. Luca Alleje threaded a neat through ball that found Gayoso who tucked the ball in with composure. Effectively, the veteran striker put the result beyond doubt with seven minutes to go. The loss keeps La Salle in fifth place with 13 points after 10 games played. An opportunity to return to winning ways comes in three days time when they square off against Adamson in a 9AM game at the same venue.